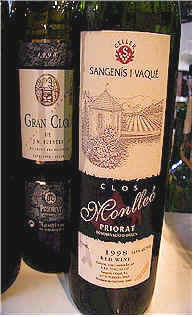 The Priorat region has been asleep for many years, awakening recently thanks to a demand for big, powerful wines. Vineyard sites we saw on a trip there were often abandoned, the small price for this back-breaking labor not being worth the effort. Recent investments have been made in vineyards and wineries, thanks to the relatively high prices some of the leading wines command. Now there are numerous opportunities to spend a serious sum of cash for the privilege of drinking one of the big reds of the region. 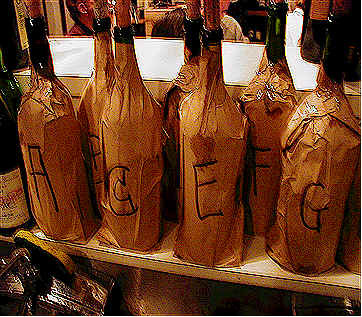 "Big" is a major part of the styling of the wines. Anything not achieving a minimum of 13.5% alcohol by volume is not eligible for the Priorat designation! As with other Spanish wines, new oak is a major component in many wines. The most recent census shows some 1,100 hectares of vines planted, scattered amongst 390 growers. 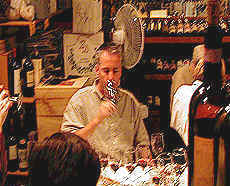 There are about 29 wineries in the region. The names of the wines are confusing. Often the most prominent words on the label are the name of the particular wine, not that of the winery. Sometimes the label sports the name of the particular vineyard site. One wine in our tasting had only the initials of the winery or bottling company. We found a few good wines. The tasters were in agreement regarding this wine: it's a bit weak and one-dimensional. 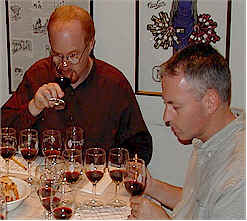 One taster likened it to wines that are made by "carbonic maceration," a whole-berry fermentation employed in Beaujolais. Someone else described this as "flabby, flat and simple." Another said "It has no real defects or flaws, it's merely a lower intensity wine." I found the typical jammy notes that often accompany grapes that have been left on the vine for a lengthy period. This is merely of "standard" or average quality. It's not bad, but doesn't represent much wine for its $45 price tag. One person defended this wine, finding "earthy, chocolate milk, cocoa, raisins and a Port-like character," though he conceded this wine is "totally out of its league" in this tasting. Most of the rest of the tasters picked up notes of "cough syrup," "spoiled and oxidized," "volatile acidity" and other elements which are typically in the category of "defective." I ranked this last, objecting to the cooked fruit and intensely jammy character. It's big, rich and ripe on the palate, with that raisined fruit coming through along with a fair bit of tannin. This wine might be one of the more "traditionally made" entries in this tasting. The group didn't have much good to say in describing this wine. "Stinky and Hydrogen sulfide" fragrances were found by the first critic. A second echoed those comments, finding rotten egg notes. Someone else found "airplane glue," while another likened the aromas to nail polish. I found it odd, with an ashy, jammy character and a hint of a pineapple fragrance. The citrusy, grapefruit peel notes give way to a bitter finish. Not much charm here! One taster described this in terms a paving contractor might enjoy, "minerally with tar and asphalt notes...soft tannins along with chocolate and oak." Someone else found it reminiscent of a "Cabernet and Merlot blend." Another taster found a "dark cherry" component to this wine. One person found some "smoky, leathery notes," while another found "Cabernet and red currants but no depth." I found some orange peel fragrance and citrus, along with a mildly peppery quality, elements I identify with Grenache. 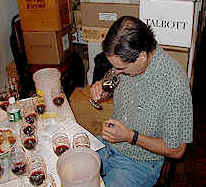 The wine is tannic and a bit astringent, though not particularly coarse or bitter on the finish. One star (three star scale, no stars being average). 4th Place: CIMS de PORRERA 1998 "Classic"
"Spicy, tamarind, licorice, full, round and ripe with cherry syrup notes" were the adjectives employed by one critic. Another found some cherry notes and "cough syrup." One taster felt this was "low in acidity and has lots of American oak, vanilla and char." Someone else said "It doesn't finish well." I found a nice hint of cedar and vanilla on the nose. It's fairly big on the palate, showing nice fruit and a bit of heat from the alcohol. The wood is less pronounced on the palate than in the nose. One-half star rating. "Ripe, rich with lots of sweet fruit...butterscotch, firm acidity and a silky texture with a black licorice note" were noted by one critic. Another liked the "long finish" of this wine, while someone else found it to have a nice "finish and perfect balance." Two others found jammy notes, one likening it to "strawberry jam." I found a heady note to the nose, intense berryish but a bit covered by alcohol. It's big and rich on the palate, being bold and robust, yet the fruit seems a bit covered. One taster said this "has a French fragrance, with some barnyard and vegetal notes" they find in some French wines. Another described this as having "mineral notes, a hint of bread dough, Merlot-like with tobacco and herbs and a cigar box character." Someone else found the nose to show some alcohol, but also "sage, cedar and dark roses." "This has good structure," said another critic, "as the tannins are forward. The wine has nice depth and pretty oak." Another person felt the tannins were "overpowering," while another agreed, feeling this is "bitter and very tannic, low in acidity and perhaps with a bit of volatile acidity." "Wet bark and raw oak" were detected by another critic. I found the ripe, woodsy notes....lots of lumber here! It is quite full and rich on the palate, the oak being the main theme of this showy red. One star+. Five to eight years of cellaring potential. "Medium bodied, more elegant and classy than the rest of the field," said one taster. Another found "dark cherry notes with hints of vanilla, dark fruits and very fine balance." Someone else likened this to the "Bryant Family Cabernet-style, as it has lots of blackberries, chocolate and pepper." Another found "Nice, sweet red licorice and persimmon spices...also chocolate and espresso. It's soft, so drink it soon." The nose of this was sensational! Sweet wood and nice fruit...vanilla cream. The same elements come through on the palate, the wine being rich, oaky and yet fruity, too. Two and a half stars. Five to eight years of cellaring potential.